Many questions loomed prior to last weekend’s Premier League matches. Could the two Manchester clubs maintain their 100% record? Could Arsenal come back from their 8-2 thrashing at Old Trafford? And would the £468,000,000 of transfers pay (excuse the pun) off? The game of the week for me was Manchester City vs. Wigan Athletic: Manchester City dominated Wigan in their 4-0 win despite the recent resignation of club chief executive, Gary Cook. The only real surprise of the game was the starting eleven, in which Carlos Tevez (who claimed he would never return to Manchester again two months ago) featured, however not so surprisingly he was not given the captains armband. Gael Clichy had a very good game and was a persistent threat with his lethal crosses. In fact only five minutes into the game he almost set Adam Johnson up with the opener. Not so surprisingly Tevez had a disappointing game, he had a poor penalty saved and at one point when broke into the box he slipped costing City what could have been a goal. The Argentine had one moment of brilliance though, when he attempted to bicycle kick in a deflected header, but the keeper dealt with it. The opening goal came in the 13th minute from the former Athletico Madrid striker Sergio Aguero as a result of a superb pass through the box by David Silva. Samir Nasri came on for Tevez in the second half and made an instant impact by setting up Aguero for his second goal with a perfect through ball. And Aguero completed his hat trick in the 69th minute, however Silva has to take the credit. He dribbled past three Wigan players in quick succession and played another through ball for Aguero. He could not miss but it was still a sublime finish by the Argentinean international. Bolton Wanderers vs. Manchester United: Last season Bolton would have been fairly pleased with their results against Manchester United and with new signings a plenty they may have come to the game hoping for at least a point. But any hopes of that were dashed pretty quickly when five minutes in Javier Hernandez opened the scoring, it was downhill from there has United succeeded in putting another four goals past the underperforming Jussi Jaaskelainen. Wayne Rooney claimed the match ball in his second hat trick in a row. Stoke City vs. Liverpool: Once again the Britannia stadium proved a difficult place to pick up points for its visitors in Stoke’s 1-0 win. The only goal game from a Jonathan Walters penalty kick, which was blasted into the back of the net. Asmir Begovic had to make a succession of three saves when he was on a 1-on-1 with Jordan Henderson. Apart from that chance Liverpool created very little and did not deserve any points. Sunderland vs. Chelsea: Andres Villas-Boas’ men came out of the Stadium Of Light with a 2-1 win, a result they will be happy about as it was not as easy a some would have thought. John Terry scored a goal, which by itself is not really a surprise as he is one of the top scoring centre backs in the Premier League, but it was with his feet. Chelsea looked comfortable but did not really dominate the game and if Nicklas Bendtner had put away his early chance from a free kick it would have been a draw. Chelsea are the dark horses for me this year, what is it they say? Slow and steady wins the race. Everton vs. Aston Villa: I find this fixture often brings excitement and this 2-2 draw certainly did. Villa will be very pleased with their point at Goodison today, especially as in honesty Everton were the better side. The Villains scored two goals in three shots on target while Everton had double that and still only scored two goals. Alex McLeish’s men had to equalise twice in the game, Stiliyan Petrov got the first equaliser with a sublime strike from outside the box and Gabriel Agbonlahor got the second equaliser in the 83rd minute with a header inside the six-yard-box. Arsenal vs. Swansea City: Arsenal came into the game on the back of an embarrassing 8:2 defeat at Old Trafford and needed a win to prove they were still alive and kicking. A 1-0 win against Swansea is not exactly a statement to the world but a win straight off the back of an 8:2 loss is still quite an achievement. Andrey Arshavin made the most of a goalkeeping howler by Michael Vorm and slotted the ball into the open goal. However Swansea played very well and perhaps if they had had better luck they would have left the Emirates with a win. Wolverhampton Wanderers vs. Tottenham Hotspur: Tottenham’s new boys impressed in their 2-0 win against Wolves, the first goal coming from ex-gunner Emmanuel Adebayor with the assist coming from fellow new signing, Scott Parker. Wolves’ defence looked strong throughout the game and the showed creative ability over the course of the match, if they continue to play like that relegation should be out of the question. Peter Odemwingie scored the goal, it was perfectly flicked into the bottom corner, although he will be disappointed he had a penalty saved later in the game. Norwich played well but West Brom’s hard work was finally converted into some points. Fulham vs. Blackburn Rovers: Once again these were two sides who were yet to pick up a win and at the end of it, both sides had still failed to win, the score was 1-1. Unfortunately the game was overshadowed by a nasty head injury on David Hoilett caused by a clash of heads with Mark Schwarzer. Both sides failed to impress. After having an awful league campaign last season which resulted to a dissappointing 3rd place and change of coaching staff, Bayern Munich are proving unstoppable this season and are looking sure bets to be crowned Bundesliga Champions. Backed with the summer signings of Manuel Neuer, Jerome Boateng and return to form of some keys players who where ominious last season, Bayern are looking more a championship side than ever before, the demolition job done on freiburg proved how good the Munich giants are this season, combining fluidity with pace and vigour, Bayern ran rampant against their overwhelmed opponents, taking their tally to 15 in their last 3 games along with 3 clean sheets underlining their intentions to win back the title they lost to Borussia Dortumund last season. And with the likes of the Defending Champions Borussia Dortumnd, Bayer Leverkusen, Mainz and Schalke O4 still trying to find their feet it remains to see to who can stop the Bayern Machine patrolled by the ever present Philip Lahm, Bastian Schweinstiger, Franck Ribery, Arjen Robben and the free scoring Mario Gomez from winning the Bundesliga once more. The Albiceleste, first offensive nation with an ambitious and attractive style, is now going deeper and deeper into mediocrity. Local clubs are suffering in South America and tend to disappear quickly from continental competitions (when Estudiantes won the Libertadores cup in 2009, the club was the only Argentinean club to reach quarter finals while there were four Brazilian clubs). This added to violence around stadium and numerous political controversies illustrates how Argentinean football is quietly sinking. What happened? Here are some elements. Obviously, when a team fails (or at least does not succeed as it should), players and coaches are the first people to criticize. However, it is widely known that Argentina is one of the best reservoir of coaches and players of the world. So this means that despite tactics and technique, there is something deeper and its origins can be dated at the beginning of 2000. As often, the main reason is money. At the end of 2000, Racing is about to die and will survive thanks to a law adopted by the Congress that allows Fernando Marti to come and save the club. One year after, Racing is crowned champion. This example illustrates the global state of Argentinean football at the beginning of the 2000s and the link with politics. In 2002, the general debt of Argentinean football is 350M$ (http://www.wsc.co.uk/content/view/2956/29/). Adolfo Rodríguez Saá, president of Argentina, must face the global financial crisis and can’t help. In August, players go on strike, asking for their salaries. Things are getting worst and numerous players are starting to leave the country (the exodus will get bigger after – we’ll see why). Clubs need to find money and sell all the players they can to survive (e.g. Javier Saviola, 19 years old, leaves River Plate for 35M€). Unfortunately, this solution is not the good one. In the second half of the decade, the transfer market will reach a peak before falling down: whereas Argentina had sell players for 150M$ in 2008, 2009 profit was only 34M$. At the same time, transfer of Argentinian players between European teams where among the highest (Carlos Tevez who went to City for 25M€ or Javier Mascherano to Liverpool for 24M€ being some examples). August 2009: the Apertura tournament is suspended (http://news.bbc.co.uk/2/hi/8185095.stm). Néstor Kirchner and Julio « the Godfather » Grondona will take advantage of this situation. Grondona, the man who is leading the AFA since more than 30 years, the man who signed a ridiculous TV contract with TyC for 20 seasons in the 90s, ensuring regular money entry for AFA but not the clubs. Kirchner, former Argentina president, the man who put football at the center of his political campaign (e.g, Diego Maradona was appointed as the national coach one day after Kirchner party lost the Congress). In Argentina, if football is one of the way to control people’s choices, it is also a wonderful way to kill your political opponents. With the crisis, Kirchner and Grondona will then target their opponent. How? By hitting their main way to talk to people: their press. Together with their devoted Diego Maradona, Kirchner and Grondona decide to end the TV contract with TyC and nationalize Argentinian football. Behind the argument of trying to “save local football and to bring it to everybody” (Futbol para todos), Kirchner targets Clarin, the main and the more negative press group of the country. Clarin, who owns TyC, is now losing one of its main profit (the group communicated about a loss around 390M$ per annum until 2014). But, more interestingly for Kirchner, people are now watching state TV programs. One week after the contract ended, Clarin was raided by fiscal agents sent by the government (http://www.reuters.com/article/idUSN1040423020090910). Never mind the clubs: the goal is to keep his seat on the best chair. If clubs want to face the crisis, they have to sell their players, TV rights won’t help. To the financial crisis touching behind the scene, one other crisis occurs around the field with the increasing power of the Barras Bravas, a kind of ultras from South America but with quite more violent. Indeed, they are often connected to gangs, controlling ticket sales as well as linked to drug market and have a direct influence on club’s decisions (putting pressure on the players, threatening them (seen for example what happened last week to Rogelio Funes Mori (http://playfutbol.infobae.com/notas/603017-Funes-Mori-fue-amenazado-de-muerte-en-su-domicilio)) as well as coaches…). As often, gangs mean also links with local police and politics. Their influence is so wide that when elections are approaching, presidents of the clubs have to deal with them. They clearly decide who will take the club in charge. In other words, if you do not have their support, you can’t play any role on the club. Numerous murders of Barras Bravas leaders have been connected to politics. Indeed, in a country where football has a political dimension, the voice of the Barras Bravas can change an election (some politician thus pay some Barras Bravas to obtain advertisements on their banners in the stadiums). A very recent example is given by the relegation of River Plate. Following relegation of one of the most important club of the country, politicians wanted to modify the rules in order to be sure that River Plate would come back to Primera A next year. This project should have been voted on October 18th, five days before the national elections. It was clear that Cristina Kirchner, the actual president, wanted to gain River fan’s votes. One other example illustrates the power of Barras Bravas. During the last FIFA World Cup in South Africa, numerous leaders of some Barras Bravas, even if being under criminal investigations, were allowed by the HUA (Hinchadas Unidas Argentina) to leave the country and go to South Africa to support the Albiceleste. And once again, two persons were focusing the critics of this decision: Kirchner and Grondona. As Mónica Nizzardo (president of « Salvemos al Fútbol », an organization who tries to clean Argentinian football from corruption and violence) says: “there is no political willing to get rid of these behaviors”. As a direct consequence, it became difficult for Argentinian clubs to retain their best players. If it would have been normal to see them going to Europe, Argentinian teams have now to deal with continental rivals. Whereas Brazil managed to keep its young talents and bring back European flops (http://www.worldcupbuzz.com/the-exodus-of-brazilian-players-from-europe-to-home/), Argentina has become one of the main sources of young talents in South America as were Chile or Uruguay before and is now the world leading supplier of players (http://www.bbc.co.uk/news/world-latin-america-11342016). There are now numerous examples of young good players leaving Argentina for the neighbouring contries, among them, we could take Matías Defederico leaving Huracán for Corinthians, Dario Conca, who never played for River Plate before becoming the best football player of the year in Brazil in 2010 or, more recently, Manuel Lanzini, 18 years old, leaving River Plate for Fluminense. As a consequence, the Argentinian clubs lose their power on the field and outside of the field on their continent. As a symbol, River Plate and Boca, the two Argentinian giants, are no longer invited to the Copa Sudamericana without merit. The two giants are also facing the crisis and see new teams taking their place. Top teams of the last 5 years are not Boca or River but rather Estudiantes, Vélez or previously described as small teams Banfield, Lanús or Godoy Cruz. Times are changing in Argentina, a new era is starting. But between violence, politics, crisis and the rise of their neighbors such as Ecuador, Colombia, Chile or Uruguay, Argentina now has to face one of its major challenges: coming back at the top of South America. Finally Arsenals winless run in the premier league has ended. We as fans was expected a better showing by the team but a win is win. As expected our players where still nervous after the team was thrashed at Old Trafford. I really think Arsene would be really pleased with the results after a treacherous summer at the club. We should remember that this was after a international break and we tend to struggle after the international breaks after every season. The performance on the whole was pretty decent in the first 35 minutes as Arteta started really well. As the game went on, we got bit nervous and lacked ideas in our midfield. Our play had no injection of pace or a creative spark. Besides when Arshavin picked up the ball in a central role in the first half we struggled to create any meaningful chances. The second half was much of was much was much of the same as the only notable chance was created through some brilliance from Van Persie who hit the post. We got very sloppy as we gave away possession easily and didn't push through our advantage. We let Swansea get at us because we started playing a lot deeper and didn't fight enough to win the ball. The players looked really tired but this was when the defence stood tall with Mertesacker bringing in a sense off calm to the team. He was so composed and we defended with ease. Yes we shouldn't be happy with this result, but after this summer I think this result is just a stepping stone to better things to come. If you look at the team we had a midfield that hasn't played enough with each other. Arteta made his debut in midfield so it will take him a few games to understand the ways his team plays and get used to the runs they make. We missed Song, Gervinho as they will give the team a big boost. Song will help Ramsey, Arteta play freely as he can drive into spaces to give them more time on the ball. Song will replace Frimpong in our lineup. Then add Gervinho, his pace, trickery, directness will give our midfielders time on the ball so they can impose themselves on the game and he will also create a fair amount of chances and score goals. Gervinho will replace Arshavin in our lineup. So it’s not all bad Wenger is trying out his new signings and with Vermaelen, Wilshere, Diaby to come back we will have a good enough squad with depth that can really challenge this season. Yes we are already far behind City, United in the league but didn't Chelsea start of like a house on fire last season only to fall short. There is still eight months to go and a lot of football to go for trophies to be one. By April we will know how good this squad is and what this Arsenal can achieve. As fans we just need to be patient. We all wondered how Manchester United was going to follow up on that 8-2 thrashing off Arsenal. Many people probably expected Bolton to keep the game close against Man United seeing that they held City only to 3 goals and scored 2 themselves. If you thought this, you were wrong. Chicharito got his first goal of the season in the first 5 minutes of the match, using that incredible movement he has to get in front of Gary Cahill and score, but the ball was placed in there by Nani and it was perfectly placed cross. It only took 15 minutes later for Wayne Rooney to score a goal from a cross from Phil Jones, Wayne used bottom of his boot to guide it past Jaaskelainen to make it 2-0 United. It only took 5 minutes later for Phil Jones to make another big play as he made a bursting run into the box, after passing several Bolton defenders and he took a shot, that deflected to Rooney and he finished it home too make it his second of the game and the third for United. Bolton made several chances for themselves and David De Gea made an outstanding diving save in the first half and distributed the ball very well. There was another attack by United that resulted in Goal by Chicharito but it was called offsides. The first half ended 3-0 United. Second half began the same as the first with United controlling the ball in the Bolton half of the pitch. Anderson and Rooney dictated the play for United as each United attack went there with ease. They didn't know what to do as each attack came it overwhelmed them. It only took 13 minutes for Chicharito to score his second of the game and season with another great goal and it was on a shot from Carrick and it landed at Javier feet, and from 7 yards out he wasn't going to miss to make it 4-0 for United. At this moment Ryan Giggs came on for Ashley Young and Chris Smalling came on for the injured Johnny Evans. For those wondering why Chris didn't start is was because he played two matches for England and Sir Alex wanted to rest him. As the minutes wore on, it seem like any moment as United got numbers forward, that they were going to score and it only took 10 minutes later to make it consecutive hat tricks for Wayne Rooney and take his tally for the season to 8 already from 3 matches. He is on the road to show everyone in the world when you say best player in the world, one of your mates says Messi and the other says Rooney. If he continues to put the ball in the back of the net and keep setting up goals, people will put his name up there with Messi. United took there foot off the pedal for the last 20 minutes, if they truly wanted to, they could've made it 8-0. Only negative things that came from the match is that Tom Cleverley is out for four weeks with ligament damage, Evans has a hip problem and he will be out for Benfica match. While Evra picked up a knee knock that can also see himself out for the Benfica match. My pancakes Saturday morning looked awful, but tasted delicious. My team, unfortunately, had the opposite problem. They looked awesome, but the taste was lacking. Liverpool had 20 shots to Stoke City’s measly 4. 11 shots were on target and several of the 9 "off target" shots were close. Liverpool had 12 corners to Stoke’s 2. They had 57% of the possession (and at times I am sure it felt like more for Stoke’s fans). That sweet taste though, the one that comes when the ball is shaking the back of the goal’s netting was missing and when the two halves were completed, it was Stoke 1 – Liverpool 0, with Liverpool suffering their first defeat of the season. Tony Pulis’ Stoke made some interesting changes in the transfer window. One of the biggest was the addition of Peter Crouch (yes, insert pun here). I had finally come to terms with seeing the former Liverpool man in a Spurs jersey and it was strange to see him wearing the striped Potters jersey. He is likely to be an integral part of this growing Stoke team, but his impact on Saturday was for the most part minimal. Liverpool started the game where they left off before the international break with possession, passing and smart game play. Stoke was up to the challenge, however, and forced their hand. It was a header by Crouch to Jermaine Pennant who placed the ball perfectly to spring Jonathan Walters. 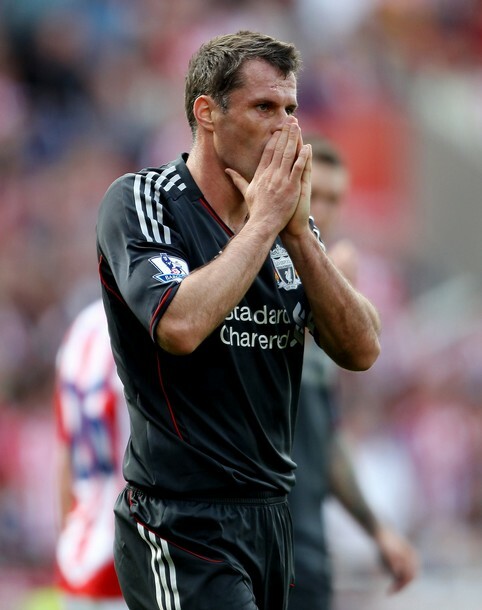 Walters had the edge on Jamie Carragher and when he went down, the referee called the penalty in the box. Walters converted and Stoke would be up in the 19th minute and never lose the lead. The promise of a bright future for Liverpool fans is there, however. Luis Suarez showed why he has become a fan favorite and new signings Stewart Downing and Jose Enrique, in particular, continued to shine and show how quickly they have become a vital part of the team. Other new signings, Jordan Henderson and Charlie Adam, struggled this game. Henderson needs a little more time to find a starting place in the team, but Liverpool still face injury woes and he is filling in admirably. The intensity of the match picked up in the second half and the insertion of Andy Carroll and Craig Bellamy in the 69th minute for Dirk Kuyt and Jordan Henderson mixed things up. Their different style of play and the ticking clock kept Liverpool on the prowl and Stoke’s defense and keeper on their toes. Stoke never faltered. If their keeper, Asmir Begovic, wasn’t making a big play, it was a defender and sometimes a striker. The return of Glen Johnson for many Liverpool fans was the final missing piece of the puzzle for the day, but (it has now been confirmed) he aggravated his hamstring shortly after coming on and was barely involved in the onslaught of pressure at the end of the game. The final nail for Liverpool was a non-call by the linesman after Matthew Upson struck the ball with his hand in the box as they entered stoppage time. Yes, he was close to Luis Suarez’s shot and couldn’t get out of the way, but it was clear that he put his arm up to deflect the ball. Jamie Carragher was quoted after the match saying that the players felt “a bit aggrieved” at the outcome, but that “[Liverpool] performed quite well…” Agreed, Jamie. Agreed. Liverpool’s next battle is against Tottenham away. Unlike Stoke, their lack of transfers in this past window has left some holes (although they managed to hold on to several key players) and it will be interesting to see what happens when Liverpool travel to White Hart Lane. Hello gooners! Enjoying our first win of the season? I know I am! We wanted to see our new signings in action and a win. We got both! Mertesacker, Arteta, Benayoun put in a brilliant shift. AND, it was a much needed win. After starting the season in nothing short of a disastrous way, we're finally seeing some hope. Was there an element of luck in that win? Sure, I'd say. If you saw the only goal of the match scored by Arshavin, it was an awful clanger by Vorm the Swansea keeper. His absent mindedness would've probably brought back fond memories of Big Almunia in some of your minds! But, Arshavin wasn't unattentive. As soon as he saw the ball and saw Vorm out of his line, he took a brilliant shot and just curled the ball into the net. Yes, it was a gift but a brilliant finish nonetheless. Arsenal 1-0 up right before half-time. If any club loses three major players in one summer, it's pretty hard to rebuild. Not only you need good signings to feel the gaps, you need good spirit in the squad and a lot of confidence to turn back and just get into the season. How did Arsenal start the season? Apart from Gervinho, no new signings till the last minute. Players leaving left, right and center. Zero confidence throughout the squad. Suspensions and injuries...horrific situation. On the top of that, fans were angry, really enraged from the lack of signings. In one sentence, we started the season with plenty of negative stuff around. Losing to Liverpool and Man U just added more insult. Now, I am not saying that after winning against Swansea, we've got past all that, we've turned back...no. But, things are starting to look good. Our new signings, albeit on first look, looks right in place. Certainly they'll need more time to gel together with the team. Important players are returning ala Song and Gervinho. Wilshere and Vermaelen are big miss but we now have resources to cope. Young players like Gibbs, Frimpong and Ramsey seems to have stepped up, they are looking quite mature. Fans are looking quite happy at the moment seeing the new gunners in the squad! There's a hint of the famous Arsenal resilience in there. We are slowly but surely arranging things around. The way we held on defensively after the goal looked impressive. The defence didn't look shaky, especially from set-pieces. I am sure if this was last season, we would've lost, or atleast drawn the same match. We were a bit short in the creative department. But, a midfield of two teenagers and a new signing did as much as they can. The midfield covered for the defence well. Sure there are room for improvement in every department, but right in this moment things are starting to look like they are falling right into pieces. We have two very important games next week against Borussia Dortmund and Blackburn. I am sure we can get good results out of both games, God willing. Win in both games will be a huge mental boost, both for the fans and the squad. So, looking forward to that! As for gooners reading this article, let's get behind the team. They need our support. Last night a reporter asked Arteta if he thinks Arsenal can challenge for titles this season...here's what he says. "When you play for Arsenal, it's obligatory to win trophies and be right at the top. We're confident that we can do that.'' Now, that's the spirit Mikel! He's quickly becoming my favourite player! Just like him, I'm sure there are good times ahead! Last words, don't get disheartened seeing both Manchester clubs getting a flying start. Remember Chelsea last season? If we can do our things right, we won't need to look towards them. And the best thing? Tottenham is STILL behind us! Right where they belong! I hope you enjoyed my writing. Ciao from Bangladesh. See you all later in a different article! Now that's a title! It's been quite a roller coaster over the last fortnight. The 8-2, our transfer dealings, international break, injuries and suspensions have made for quite the entertaining start of the season, to say the least. I'll start off with ranking our most important signings, which was a big request. Let's begin. A great dribbler with attacking flair and pace, Gervinho brings the long lost cutting edge to our front line. He was the main reason we qualified for the Champions League, bossing the left flank against a stiff Udinese defence. AW pulled a masterstroke for the price he paid, believed to be hovering around £12m. If Gervinho were English, could you imagine the price Kenny Daglish would pay for him? Gervinho will turn out to be quite the bargain, and he can only get better. Definitely our most exciting signing. With both Na$ri and Fabregas gone, we looked very short on options for a creative centre midfielder. We still had Aaron Ramsey and Jack WIlshere, but fans now realize that a team as big as Arsenal can't rely on two young starlets to guide them to glory. With Wilshere injured for the coming months, it left Ramsey and Tomas Rosicky to step up to create a much needed spark in midfield. While they performed admirably at times, their efforts were;t enough, as we lacked the final ball to set up a goal time and time again. This is where Mikel Arteta steps in. Also a graduate of the famed La Masia academy. Arteta came to Everton, and lit up the stage. Unfortunately, injuries have held him back in the past few seasons, but he still has time as a footballer to accomplish something. Two Players of a similar mold, Arteta slots seamlessly into Fabregas' abandoned role. While some fans argue he's never played in the Champions League, and he's no where near the ability of Fabregas, have a look at the Swansea game. He is no Fabregas, don't delude yourself, but what he is is a quality, experienced and talented player who knows the EPL inside and out. He isn't some youngster whizz kid no one has heard of from Ligue 1. I am glad we managed to get this signing done, simply because this was the position most lacking during the window. Most people aren't happy with this signing, simply for it's face value. What they don't realize os that Santos is a well qualified, full international with experience. Are you seeing a trend here? Not only is Wenger willing to actually, erm, spend some money, but he's spending on people over 21! Perhaps the 8-2 was a blessing in disguise. Anyway, we find ourselves with a decent left back, other than the deluded Frenchman, Clichy. This is a great signing for now, until Gibbs is truly ready to take over the mantel. If you follow me on Twitter, you'll know how much I cried and cried for Merteacker to be signed in June and July. He was our best option, and the most likely to materialize. Finally, it seems as though the fans have gotten through to Wenger, as the big German is finally here. Before you all go and slate me for simply wanting one of the largest defenders around, I must say this. i loathed the idea of signing Samba, I really did. He was never very good to begin with, and his height and strength are his only redeeming qualities. He would have costed more, and we would have gotten less of a player. Instead, we opted for a full international with over 70 caps for under 10 mill. He is an extremely clean tackler, and never over commits himself, unlike Koscielny. People may criticize Mertesacker for being slow, but both Vermaelen and Laurent are very quick CBs, we don't need a third. People may criticize Per, but he would cost 20 million if he were English. Now that's out of my system, let's move on to yesterday's match. We were extremely lucky to walk out with 3 points, so we're not in the clear yet. Mind you, we're missing important players, and our new signings need time to gel with our current players, so all in due time. At this stage we can only improve, so let's take a look at each section's performance. Not too shabby for a weakened defense, to say the least. Mertesacker looked slightly out of his depth, because he hasn't had any time to adjust, let alone figure out who's doing what in the back line. Within a couple of weeks, he'll be performing much better than what you saw last night. Szczesny was rock solid as usual, and proved to me that Fabianski may be left to rot on the bench this season, which is a shame. He had hit a bit of form for the first time last season, and it's awful to be pushed back the way he has. Nonetheless, an average performance from our back four. While most people would agree that our midfield was nothing special, I would like to point out the immediate impact of Mikel Arteta in the first half. Within the first minute, Arteta had made a great chance out of nothing, leaving a perfectly weighted pass up to Aaron Ramsey to slot home. A good sign, surely. He will need very little time to adjust to Arsenal, because he's playing in a similar role in the same league. He has great vision and passing technique, and a wicked free kick. He started to fade off a little as the second half pressed on, but it's not too worrying, as he still was involved in almost every play. Wenger needs t really push him to take risks on the pitch, otherwise we could fall into the same trap of sideways passing. Not much to say about anybody else on the day, other than Arshavin's slow climb back to form. A couple more weeks and he'll be back to his best I believe. Robin Van Persie must have been feeling extra frisky last night, because he was often taking on the Swansea defense all by himself, and he damn near scored, with a great weak foot shot ringing off the outside of the post. Hopefully he remains fit, as we'll really need him this month against a tight Dortmund defense. I hope you enjoyed this article, and that you all follow MarshallArsenal on twitter, all good gooners do! Till next time, cheers. Saturday's result at home is not the ideal choice for Dortmund to get heading towards the Champions League encounter with Arsenal FC. Dortmund's defense was broken apart all day by amazing runs and counterattacks by the Berlin attack. Also with the absence of Mario Götze, Dortmund were unable to really trouble the Berlin defense as well. This was not the result Jürgen Klopp wanted ahead of a Champions League tie with Arsenal. After a scoreless first half, Hertha Berlin were able to take the lead in the 50th minute when Raffael dribbled past a confused Dortmund defense had a shot on goal that was saved but was able to score on the rebound. Berlin were eager to get a second goal to secure a shocking win, but were denied twice by the woodwork on attempts by Raffael. After bombarding the Dortmund defense continuously, they were able to secure the win in the 81st minute with a Peter Niemeyer header via corner kick. Dortmund were able to pull a goal back when Robert Lewandowski headed one into the back of the net, but it was too late for any chance to mount a comeback. Berlin gets a surprising three points on the road, while the defending champs have lost their second game of the season and are now trailing league leaders Bayern Munich by five points. Hertha Berlin were able to reveal many of the flaws that this Borussia Dortmund side (Arsenal supporters pay attention). Dortmund's Centre backs (Hummels and Subotic) lack pace and are susceptible of being beat by players with pace. Dortmund's defense has trouble when teams go on the counter. Dortmund play good in spurts, but at times they systematically fall apart. Most of Dortmund's attack is put on Mario Götze. Barrios is still injured, leaving the front line very thin. They still haven't replaced the quality of Nuri Sahin, who was vital in their attack. Dortmund didn't really improve their squad this summer and lack depth if injuries occur. Jürgen Klopp's biggest concern is to able to get his squad to shake off this recent defeat and focus on their Champions league tie with Arsenal on Tuesday. This will be a tough test for Dortmund, who have already lost two games at home, against an Arsenal side that has revamped their squad with more quality and experience. Things are not looking that bright for Dortmund. Rangers continued their recent impressive away form with a 1-0 victory against Dundee United at Tannadice, in Saturday's lunchtime game. Kyle Lafferty's goal was enough to secure an 11th away league win in a row for the Ibrox men, a run that stretches back to last season. But this was far from easy for Ally Mccoist's men, even though the home side played for an hour with ten men. Ally Mccoist made two changes to the team that started against Aberdeen before the international break, with injured Nikica Jelavic making way for Juan Manuel Ortiz, plus Steven Whittaker returned at right back with youngster Ross Perry dropping to the bench. Dundee United boss Peter Houston made three changes to his starting line up from the draw against St Johnstone with Sean Dillon, Barry Douglas and Stuart Armstrong making way for Keith Watson, Danny Swanson and Scott Robertson. The home side started the brighter and Willo Flood came very close to giving United the lead when his shot deflected off Steven Whittaker and went narrowly wide. Rangers best early chance fell to striker Kyle Lafferty who picked up a through ball from Ortiz but he couldn't connect properly with his shot and Dusan Pernis easily gathered. Then Danny Swanson tested the palms of visiting keeper Allan McGregor with a fierce drive, that the Rangers keeper saved well. Swanson was involved in the action again as he broke into the box where he seemed to fall very easily under a challenge from Dorin Goian and he was duly shown a booking by referee Calum Murray. But the match was turned on its head on the half hour match when Johnny Russell crazily got himself sent off by putting his head on Kirk Broadfoot. Referee Murray had no option but to send the young striker off. With a man advantage,Rangers pressed higher up the park and a lovely ball from Ortiz sent through Steven Naismith, but he dragged his shot wide as he looked poised to open the scoring. The miss almost proved fatal as ten men United pushed for the lead as half-time approached but Garry Kenneth sent his header over the bar. Rangers came out purposely after the break and Lafferty had a shot from distanced saved by Pernis in the United goal. Another chance fell for Lafferty but he sent his header wide of the post. The next time the Northern Irishman put his head to the ball, he didn't make the same mistake. On the hour mark, Gregg Wylde sent in a great cross, which was expertly taken by Lafferty and he sent a great header past Pernis to finally give Rangers the lead. Five minutes later, it should have been two but somehow Steven Davis's shot didn't go in. He linked up superbly with Naismith and beat keeper Pernis, only to see his shot hit both posts and roll across the line without crossing it. United hadn't given up though and late on created a few tense moments for Rangers, none more so than John Ranking's rasping drive which only just went past McGregor's post. But Rangers held on for their victory, which was their fifth out of six in the SPL this season and also means they go into next weeks Old Firm game top of the table.